Omar Martin says Dave Gardner’s Got A Killer Bonus for Speedy profit creators. Just as seen in the picture! I love it…Hope you do not mind me using the picture Omar Martin as it helps you in the long run anyways! I have been watching and learning from Omar Martin for a few years now and he had never let me down. I highly endorse his work and efforts online and recommend you check him out now and grab your own Speedy Profit Creator. When you get to the sales page through my link(s) you will see my testimonial on his page, right under John Thornhill. I am not doing this to just gain commissions as I want to give you back much more than what you pay and you can see where I am coming from with my bonus. I want the thrill of the JV competition and to see you get some great materials to grow your business with as well. In the process you might even see me as a person who you want to continue doing business with in the future. I highly suggest you take the Mac Daddy and join me at the top! This is the level I have and allows you to be a reseller (and/or add as a bonus to your member area in a fee based membership site) the Basic and Pro levels. 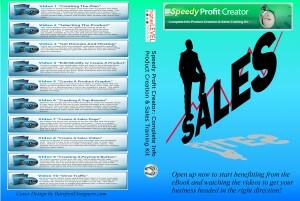 I first grabbed Omar Martin’s Speedy Profit Creator over a year ago and never looked back. It was one of the first products I got online and actually took ACTION on by following the steps set forth. The physical DVD is going for $27 and I will send that to you if you decide to order it from there, or you can just check out his newly update member site and basically get the same thing for $5 though his WSO, though I would higly suggest grabbing the “Mac Daddy” level which will let you become a reseller or add the product as a bonus in your own member area. It has other perks as well, which you can see in the WSO! So am I mad that it is now at least $60 cheaper for the reseller account…Heck no, it was more than worth that in what I have saved and learned in the process. Now that the new one is live, I can’t wait to go through the training again and see what new gems, especially in the traffic generation category Omar Martin has added. So go grab the Speedy Profit Creator by Omar Martin today and then come join us in the Facebook group to share knowledge, tips and ideas to make your products the best they can be. If you have spent time online, most likely you belong to some sort of membership site. Perhaps you entered your name into an opt-in box and joined to be able to participate in conversations and discussions with others interested in a similar topic. It does not really matter what the niche is, there are membership sites out there that exist for them. Just type in a keyword, followed by the word Forum or blog and you will get plenty to choose from. Often they are membership sites. Sometimes these sites are free, while othertimes there may be a fee to belong. With your fee, you most likely will be getting access to more content and materials than the general non-paying public. These could be educational videos or tutorials, bonus DVD’s mailed to you each month, mp3’s and the likes. The advantage is that you can give teaser content to anyone who sees the posts, but in order to see the whole thing and be able to participate, you need to upgrade your account. Think of it as dues you pay to belong to the club. There are many services out there and I personally have used Mike Filsaime’s Butterfly Marketing as well as Stu McLaren and Tracy Childers WishList Member. The Butterfly Marketing is set up to be a complete website with affiliate options and the ability to have multiple membeship levels with protected content, while the Wishlist Member is meant to integrate into a WordPress Blog (it is a plugin). As more people are running their content on blogs these days, this is crucial to have. I highly endorse both of these and you can get Butterfly Marketing open source for nothing right now, though the Wishlist Member will run you about $97. The main reasons are that the Butterfly site is not offering as much support anymore, unless you upgrade after picking up the open source software, while the Wishlist site is continuing to update and stick with the times and changes occuring online. Right now Wishlist Member is having a Christmas sale through the end of 2011 where they are offering some major bonuses which you get when you join. Some include thousands of hand drawn icons and graphics, additional plugins to control which member levels see what within a page or link and a 3 session live course that will take place in January 2012 in regards to setting up your first membership site. So if you have been thinking of getting a membership site, now is the time to do it. Perhaps you get a little spending money that you want to invest into your business. This is the ideal situation to be in. When you buy WishList Member http://yourreviewguru.com/WishListChristmas before the end of the year, you will be able to get those great bonuses. They most likely will not be there after the new year. To sweaten the deal, I will have some of my own bonuses to go along with this that you should be interested in as well that will compliment your membership sites. So go check out Wishlist Member today and rake in all the loot before your chances are gone! On Monday November 21, 2011 the affiliate sales world as we know it wil be turned upside down. This new software allows an open format for viewers to choose what they want and be directed to the products they desire, instead of seeing a limited ad that you place, which likely is nothing they are interested in. In other words, your customers will see what they want and you will get what you want in the end. A simple survey style ad allows a viewer to pick through a question or more that brings them to the model that fits them most. Where before you would be limited in what you could present to someone, now your options are hypothetically endless. Michael Rasmussen and Michael Mograbi have put together a short report that highlights this software that is live now for your enjoyment. Go read the article now and be first in line when he opens the doors to Affiliate Cash Snipers on Monday, November 21, 2011. If you have been involved in affiliate marketing in any amount, this is a software and technology you need to capitalize on. With Black Friday and Cyber Monday around the corner, you could be in on the billions of dollars spent. Why not collect some of this for yourself. Affiliate Cash Snipers Bonus: (for those who use my links and take action! 4) My Top Affiliate programs list and how to easily add html code to your sites to make them work for you. This short report will help you get started in affiliate sales or build upon what you already have going for you. 5) Membership into the Affiliate Club (a real $27 value in itself with info from great marketers like Seth Joyner, Ewen Chia and more) where I’ll give you a backdoor silver membership. In celebration of 11-11-11, I decided to run a $11.11 special on a DVD I promote that normally runs for $27. The Speedy Profit Creator is a video series created by my online friend Omar Martin and his wife Melinda. The Martins put together a series of 10 marketing videos that walk you through the process of getting yourself online to creating your own product, making graphics and bringing traffic to your site and product. Each video is up to an hour long and full of content and directions to hold your hand and walk you through the process. To compliment this, a PDF is included which allows you to follow along and learn through another medium. As an added bonus there are some other reports in there by yours truly which continue your education in regards to working through social media sites, google places and others to bring traffic to your site in many ways. I am running this sale for 11 days to celebrate the 11-11-11 phenomenon and putting the price tag of just $11.11. Feel free to pay me more when you realize how beneficial this is and will be to you. When you realize you can do many of these things on your own and reduce the cost associated with outsourcing and hiring others to do the tasks you will confirm your belief it is a great value. Unlike getting an educational product off of a site like Amazon.com where you will never get support or training tips, all you have to do is get in touch with me and I will help you with as much as I can as I have been through the videos and actually arranged the disk using content learned in the Speedy Profit Creator DVD videos themselves.